Brief Description A wonderful new show from DEB FILLER! Description For immediate release. PLEASE ADD TO LISTINGS. DEB FILLER’S GOT INCREDIBLE STORIES TO TELL! ONE WEEK ONLY! MAY 23-28! 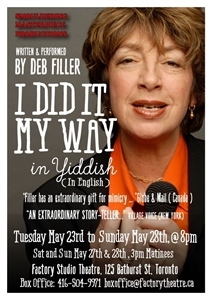 March 27, 2017 (Toronto, ON): The internationally-renowned comic performer, musician and writer Deb Filler returns to Toronto with her new one-woman show, I Did It My Way in Yiddish (in English), heading to Factory Theatre for its Canadian premiere for one week only - from Tuesday May 23 (opening night) to Sunday May 28! Tickets are on sale now with special Earlybird Pricing if booked prior to May 1st! In this international smash hit, New Zealand’s only Jewish comic entertains with a brilliant evening of stories and songs audiences will never ever forget. Among others, Filler recounts funny, moving, stories of her meetings with the Lennys: Leonard Cohen, Leonard Bernstein and another Jewish musician called Lenny. The audience delightedly travels along with Deb as she journeys around the world on this jam-packed music-filled show, with just a guitar and a raft of loveable characters she creates. Originally commissioned and presented by London, England’s JW3, it has also wowed audiences in Jerusalem, Sydney and Los Angeles. Filler now brings I Did It My Way in Yiddish (in English) to Toronto for its Canadian premiere, directed by John Shooter (Precisely Peter Productions’ Talking Heads, Abigail’s Party, The Pitchfork Disney), letting us in on her truly incredible (and mostly-true) stories. As Deb drives for a car service in New York City, she takes us on a truly incredible ride with Leonard Cohen, reducing the venerable Canadian folksinger to tears of laughter. Her story of meeting Leonard Bernstein as a teen, bringing him fresh challah bread from her father, a survivor of the Holocaust who heard Bernstein play Gershwin's Rhapsody in Blue in a Displaced Persons' Camp after the war, is extraordinary. What happens next is truly unbelievable. Those stories and others are the heart of I Did It My Way In Yiddish (in English). Filler last performed at Factory’s Studio Theatre in 2014 with her sold out I Lost It In Kiev. Toronto is set to be charmed again with this funny, poignant and utterly exhilarating show. Deb Filler is an internationally acclaimed theatre, character, comic and musical artist. Deb was recently cast in “CHUMS”, a new TV series for FX as a feature performer, and appeared in the hit feature documentary The Last Laugh, alongside comedy legends Mel Brooks, Sarah Silverman and Carl Reiner. She was also in the acclaimed Yiddish theatre production of Death of A Salesman (Ashkenaz Foundation at the Toronto Centre for the Arts) and Talking Heads, with Fiona Reid, at Toronto’s Campbell House Museum. Now Deb is ready to slay ‘em in the aisles again. Add I Did It My Way In Yiddish (in English) to your free online travel itinerary.